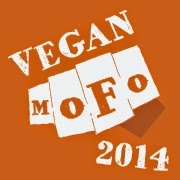 For my salad-themed Vegan Mofo entry today, we are entering new territory, readers: the breakfast salad. Do not fear- I am not going to eat a bunch of spring mix with balsamic at 7 am and call it a breakfast salad. Since I absolutely cannot stomach the thought of eating something savory at 7 am, I have put together this sweet breakfast concoction. Enter sprouted buckwheat. 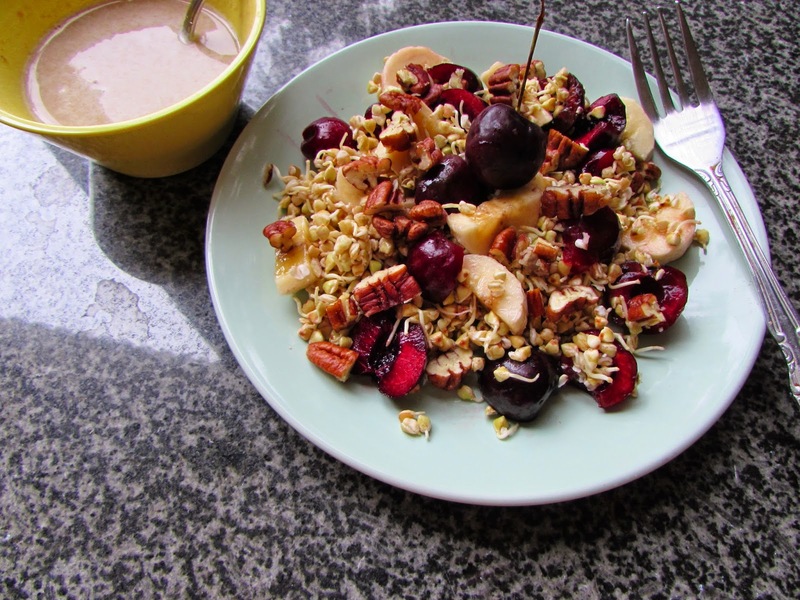 This salad is a mixture of sprouted buckwheat, cherries, bananas and pecans, drizzled with a protein powder dressing. 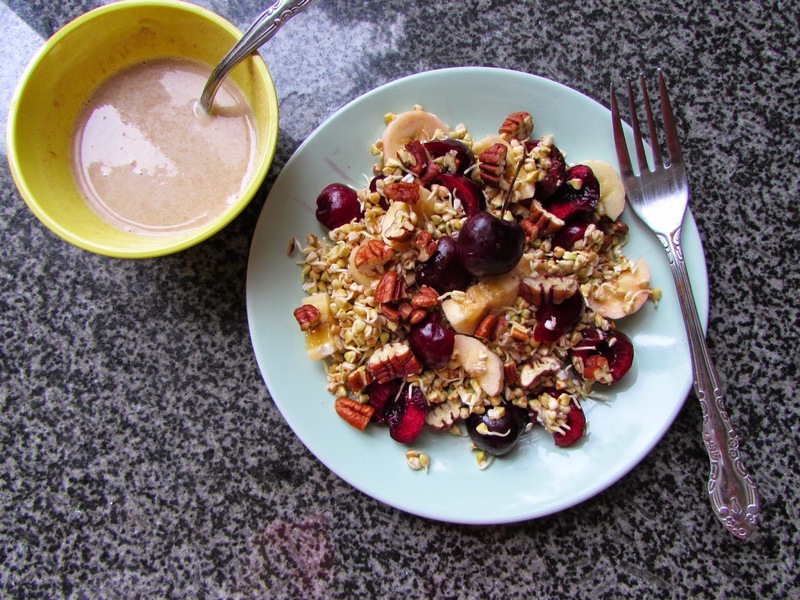 You may be asking yourself “What the hell is sprouted buckwheat? Did Maggie go off her rocker?” Well, duh yes, to the latter. As for the former, sprouted buckwheat is a scary, imposing sounding thing that is actually very tasty and ridiculously easy to make. To sprout buckwheat, let it soak in water for 20 mins. Then, drain off the water and rinse the buckwheat well. They may feel goopy and this is totally normal. Just make sure you rinse this goop off. Then place the buckwheat in a colander and place the colander inside of a bowl. Cover with a tea towel or some cheese cloth. It doesn’t have to be tight, as these are living and they do need air, after all. Then, for the next two days or so, rinse the buckwheat with water and then return the colander to the bowl and cover. In about 2-3 days (depending on how warm your house is), you should see tiny white tails come out of the buckwheat pyramids! It is very exciting, or at least, it was the first time this nerd sprouted buckwheat. The buckwheat can keep for a week in the fridge. For more detailed instructions, see this website. Also note that if you see white fuzz attached to the sprouts- do not freak out- this is not mold. It is just root hairs, which tend to pop up between rinses. They will subside once you rinse. I learned this the hard way, chucking the buckwheat in the trash, to then google and find out that many beginner sprouters make this mistake. Le sigh. 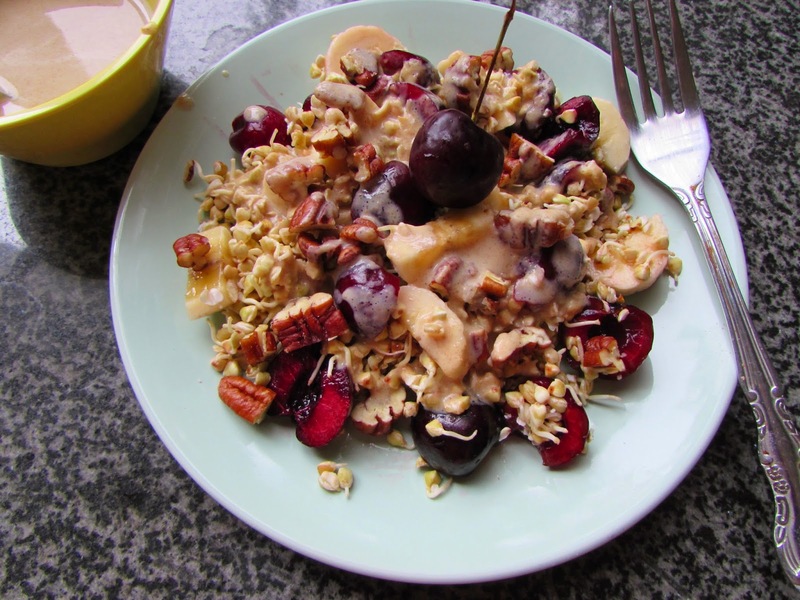 This breakfast salad incorporates rich reddish-purple cherries (I always count my blessings for this inane kitchen tool whenever cherry season comes about and I make a whopping 2 cherry dishes), bananas, and crunchy pecans, but would be delicious with any fruit or nut combo of your heart’s desire. Mix together first 3 ingredients in a small bowl. This is the dressing. Place rest of ingredients on plate and drizzle with the dressing. Note: I used Vanilla Sunwarrior Warrior Blend protein powder. The buckwheat measurement is unsprouted. Hi Julie! Thank you so much 🙂 I hope you try it out!